Bizagi Operational Data Store (ODS) is an optional feature, designed and recommended to improve Automation Server's performance and availability. The concept behind Bizagi ODS is to avoid affecting the daily processes and Work portal performance with the effort required for queries and analysis reports. Through the Bizagi ODS, you create a read-only database replica to use for Process Analytics requests (such as BAM and Analysis tasks) and to run queries. This way, the resources involved for such purposes do not affect the transactional database to enhance its availability. This feature is especially powerful in mission-critical applications and whenever high volumes of information are demanded to run analysis queries. This feature is not eligible for Automation Server. ODS configuration is not targeted for cloud environments since these environments already implement architecture leveraging cloud native services that optimize separately, the process runtime operations and any query to reports or analytics. Through Bizagi ODS configuration, the BAM and Analytics or the queries module in the Work Portal make use of a database which is a separate replica of the database used as the Processes repository. This lets operations and requests executing queries with a large amount of data (such as the requests for Analysis Reports for real-time monitoring or historical analysis), be carried out without using the resources employed for the daily Process Activities. To use Bizagi ODS, you will need to configure replication for your Process repository (Bizagi project database). Configure database replication at the database configuration itself, and requires different steps according to the database engine used (SQL Server, Oracle). Once this replication is set up, following the description and recommendations below in the ODS Configuration Guidelines, setting up the ODS feature requires configuring the connection information in Bizagi (the connection string) to that replicated database. •For SQL Server 2008, 2008 R2: http://technet.microsoft.com/en-us/library/ms151198.aspx. Setting up a database replica is also helpful in business cases where you wish to integrate a reporting suite or other BI tools, so these tools do not execute queries directly at the transactional database but use the replica instead. Proper configuration of a replicated database and any further security settings, are responsibility of the database administrator. 1. Bizagi's database is the only publisher. No matter how many intermediary distributors are used, the main database of Bizagi (Process repository) must be the only one replicating its data into the ODS. To have updated information for BAM reports, every action in the main system must be transmitted quickly to the ODS. For example, transactional replication achieves this in Microsoft SQL Server. Operations in the ODS must not affect the main Bizagi database. The ODS can be used to build aggregations, temporal data, intermediary tables, or other data that is not necessary in the main system. 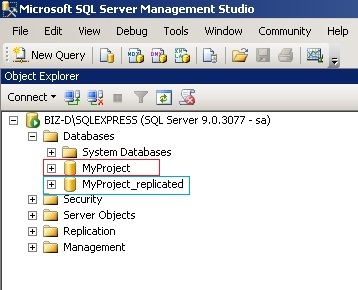 For example, transactional replication achieves this in Microsoft SQL Server. 4. Proper replication size estimation. Given that some database-writing operations involve large data transactions (for example editing diagrams in Bizagi Studio or uploading files to the web application), we recommend that you estimate an adequate approximate size for the replication articles and configure them where necessary. You can measure them in a test environment. For example, for the Max Text replication Data option used in Microsoft SQL Server, 3 to 5 MB is usually sufficient. Usually, the main database and the ODS reside in different database servers. Use domain accounts such as the SQL Server Agent to run replication services. Avoid accounts such as "Local System", because the credentials for this account have no access to shares on the network, and it is not an authenticated network account. Once you have set up your database replica, configure connectivity to the ODS in Bizagi. •Enable ODS for Process Analytics. •Enable ODS to run queries.